The Internet in Cuba: What stopped the Cuban Internet in 1996 and what is stopping it today? What stopped the Cuban Internet in 1996 and what is stopping it today? The problem today is bureaucracy and its companions -- fear of competition, change and stepping out of line. Cuba connected to the Internet in 1996, but three factors stifled the Cuban Net: the US embargo, economic depression during what the Cubans call the "special period" after the disintegration of the Soviet Union and the Cuban government's fear of free information, which was also fed in part by the Soviet collapse. As Raúl Castro said in 1997, "Glasnost, which undermined the USSR and other socialist countries consisted in handing over the mass media, one by one, to the enemies of socialism." Cuba would not make the same mistake. Twenty years later, time has eroded each of those obstacles. China and other nations have filled the gap left by US Internet infrastructure suppliers -- Huawei has replaced Cisco and China played a major role in the financing and construction of the undersea cable connecting Cuba and Venezuela. While Cuba remains poor, the economy has improved since the special period and there is frustrated demand for Internet service. This should have fueled government and/or private investment, but it has not. Cuba's Human Development Index -- a measure of national income, health and education -- is the second highest in Latin America and the Caribbean, but it is the least connected nation in the region. Finally, the Cuban government points to USAID projects like ZunZuneo and the Alan Gross affair as proof of a US war on the regime. That makes for good propaganda and provides an excuse for Cuba's lame Internet, but I think Cuba's leaders are smart enough to realize that these efforts, had they succeeded, would have been drops in the bucket. Furthermore, Cuba has had twenty years to observe nations like China, which encourage the Internet while selectively blocking content and, more important, surveilling users. So, if I am right, what is stopping the Cuban Internet today? Or, to take a concrete example, why would ETECSA, Cuba's Internet/phone/mobile monopoly, want to deploy outdated DSL in homes or 3G mobile technology? Who made those decisions and why? Consider AP journalist Michael Weissenstein's coverage of the recent Communist Party Congress. He reports that "Raúl Castro blamed 'an obsolete mentality' and 'attitude of inertia' for the state's failure to implement reforms meant to increase productivity." Weissenstein goes on to state that First Vice President Miguel Diaz-Canel, long seen as Castro's successor, agreed, saying that obsolete ways of thinking led both to inertia in enacting reforms and "a lack of confidence in the future." Diaz-Canel also stated that "Along with other deficiencies, there's a lack of readiness, high standards and control, and little foresight or initiative from sectors and bureaucrats in charge of making these goals a reality," in an excerpt of a speech broadcast on state television. The country has many things going against it as it tries to make the journey. It suffers from the dysfunctions that afflict countries that have giant bureaucratic states lying heavy on society. Those at the top have been trained all their lives to regulate and control. The governing elites speak (at great length) in lifeless ideological jargon. It would be depressing if that were the end of the story, so let me digress on what makes Brooks optimistic. When he met with Cuban artists, he felt "a sense of national solidarity and a confident patriotic spirit that is today lacking in the United States." 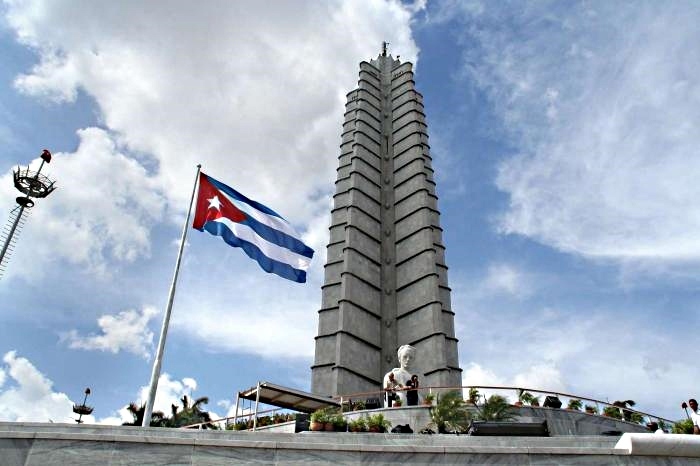 He attributes Cuban national pride to their impressive cultural achievements and singles out the writing and life of José Martí, the 19th-century poet and journalist "who shifted the national imagination, who told Cubans who they were and what their story was" -- inspiring a "common faith in a dignified future." Martí died fighting for Cuban independence from Spain, but feared the possibility of a cultural and economic takeover by the United States. You have to admire a man who both sides of the Cuba debate claim as theirs. He is Cuba's national hero, but, when the Reagan administration began broadcasting "Radio Free Europe/Radio Free Liberty" to Cuba, they named it "Radio Martí" and Obama honored him during his recent Cuban trip. Brooks writes that he "was amazed how much Martí’s name came up in conversation [during the trip] and how little Fidel Castro’s did." José Martí Memorial. He was honored by Reagan, Castro and Obama. Having digressed, let's get back to the Internet. The grip of bureaucracy on the Cuban Internet is not unique. Bureaucracy arises wherever game-playing, not merit, determines success. Excellence and hard work -- "rate busting" -- can become liabilities. Many nations have made transitions since the dissolution of the Soviet Union -- Cuba is only the latest. Cuba can consider and learn from the Internet strategies of nations from Estonia to Russia. (That should be an easy choice). Cuba is also free to consider the Internet infrastructure ownership and regulation policies of non-Soviet governments and create a uniquely Cuban Internet -- one that benefits the Cuban people and provides ideas for the rest of the world. Cuba's recent home Internet expansion provides an example of the impact of stultifying bureaucracy when compared to home connectivity in the US. If I go to the Web site of my home ISP, I am given a choice of three plans -- each with a different speed and price. If I go to ETECSA's home Internet site, I find four speed options (1,2,3 or 4 Mbps) and 85 frequently asked questions (FAQs) describing the service. My Spanish is not so great so after looking at the FAQs, I asked my wife, a native Spanish speaker, if she could help me understand the offering. For example, a monthly payment covers 30 hours of connectivity at a given rate, but what happens if one uses their 30 hours in less than a month? Can they purchase an additional 30 hours? If so, do they have a month to use that time or must they use it during the month they already began? It seems that one cannot carry unused time from one month to the next ("Estas horas no son acumulativas"). ETECSA's home service also seems to differ from other nation's in that the account is not associated with a home, but with a user. If two or more Nauta users live in the same home, would they each be expected to have accounts? It seems there is some flexibility in the place from which one uses their account -- home, a WiFi hotspot or a fixed "navigation" facility, but my wife lost patience and was not willing to humor me by continuing to study the FAQs. My favorite FAQ is number 84 -- "Why is the navigation slow?" Their answer is that it could be many things and they list four that might be wrong with the user's computer or configuration, but don't mention network congestion or the fact that their offering is too slow for today's dynamic, multimedia Web pages. The exorbitant price of this slow (the US FCC defines "broadband" as at least 25 Mbps download) connectivity can be explained (not justified) by ETECSA wanting to make a profit on their DSL investment, but the fact that it takes 85 FAQs to define the service is a reflection of the same sort of bureaucracy that led Cuba to enumerate the 201 occupations that are eligible for self-employment. Bureaucracy might also explain the 2015 decision to invest in DSL technology in the first place. Such a child-care attendant must have a space large enough to devote a minimum of 21.5 square feet to each child and be able to lay in a stock of personal toiletry items for each of the children. That includes a comb, toothbrush, bath towels, hygienic towels, cutlery, mugs and other items — all labeled with the child’s name. And the new rules specify the hooks for their towels must be a minimum of 20 centimeters (3.94 inches) apart. As far as I know, the goofy list of occupations that are eligible for self-employment is unchanged. Protection of state-run enterprises and bureaucrat's jobs remain significant roadblocks.